Welcome to Elements Festival 2019, a vast, multidimensional mini-world for you to explore, filled with mountains, trees, fresh air, clear skies and music. 3 days (plus a bonus round) of bangin’ electronic music, art, workshops, and markets. 18th - 20th October 2019. Sunshine Coast Hinterland, South East Queensland, Australia. 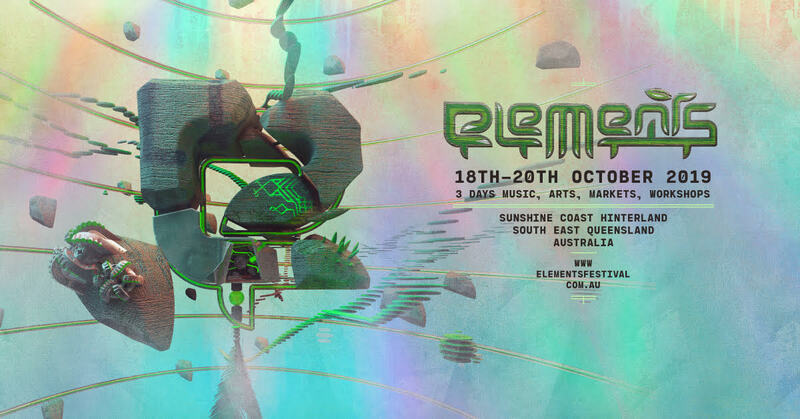 In a lush little nook of South-East Queensland, Australia, the Elements crew are busy bringing together a festival designed to play out like a real-life game. In our world, no two players ever share the same story arc, meaning your Elements experience will be as unique to you as your fingerprints. What we do guarantee is that you will get to enjoy 3-4 days of artists and creatives bringing you next-level electronic music, light shows, performance and visionary art, workshops, markets and an almighty bounty of ridiculously tasty food. All of this you get to enjoy in the beauty of the Australian bush, alongside 3000-4000 of your closest mates and future friends in the making. © 2019 Ticketbooth on behalf of Elements AU. All sales are final. Tickets are non-refundable.